The books for children are among the most wonderful in this season. 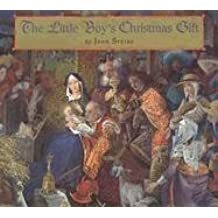 A particularly beautiful one is The Little Boy’s Christmas Gift by John Speirs. The artwork is amazing, and the story lovely. A little boy, son of a garderer, follows the Magi to see the baby Jesus. He brings a little tree in a small sack. Each beautifully decorated part of the story reads like this: And so they journeyed on … The wise men with their richly laden camels, the nomads with their brightly woven rugs, the herdsmen with their goats, and the olive growers with their jars of oil. Nobody noticed the boy with the small brown sack trudging along behind them in the dust and shadows. The ending magical, and this is a great book to read to children of all ages!